In 2018, Indonesia has an installed capacity of the Geothermal Power Plant (PLTP) reaching 1,948.5 mega watts (MW). With these achievements, placing Indonesia in the second position in the world after the United States in utilizing geothermal energy as electricity. Geographically, Indonesia has around 500 volcanoes, of which 127 are active volcanoes, making Indonesia has enormous potential in developing geothermal energy. 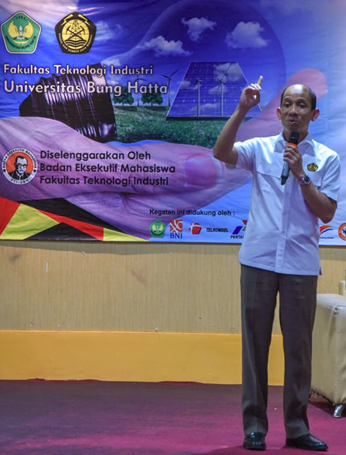 Deputy Minister of Energy and Mineral Resources (ESDM) Arcandra Tahar stressed that the Government encourages every region to always see the potential of existing local wisdom to meet its energy needs, especially new renewable energy. Arcandra also requested that the young generation not only believe in issues that are not true and cannot be accounted for. If you believe, let's find a way out, but if we don't believe how we can find a way out, not just seeking justification, "said Arcandra when delivering a Public Lecture at Bung Hatta University, Padang, Thursday (1/24). For this reason, Arcandra advised the young generation to change their mindset, open their minds far ahead and do something tangible and useful for the people. "I suggest to the young generation, other people have been thinking far, but we are still talking about environmentally friendly or not," said Arcandra. On the same occasion, West Sumatra Governor Irwan Prayitno said that West Sumatra Province had declared it a green energy barn. At present, around 36 percent of the energy used in West Sumatra comes from renewable energy or higher than the national average.